This weekend my friend and I drove up to visit another dear friend in Philly. I hadn’t been to the City of Brotherly Love in ages, and had heard about all of the gastronomical delights that lurked just a couple of hours north. I did the math on Friday, and I hadn’t eaten anything processed, refined, (and aside from a sushi dinner), nothing that I hadn’t created with my own two hands in over 35 days! I knew that it was time to really give my taste buds a workout and Philly was the perfect place to re-acquaint those little suckers with meat and dairy and sugar. 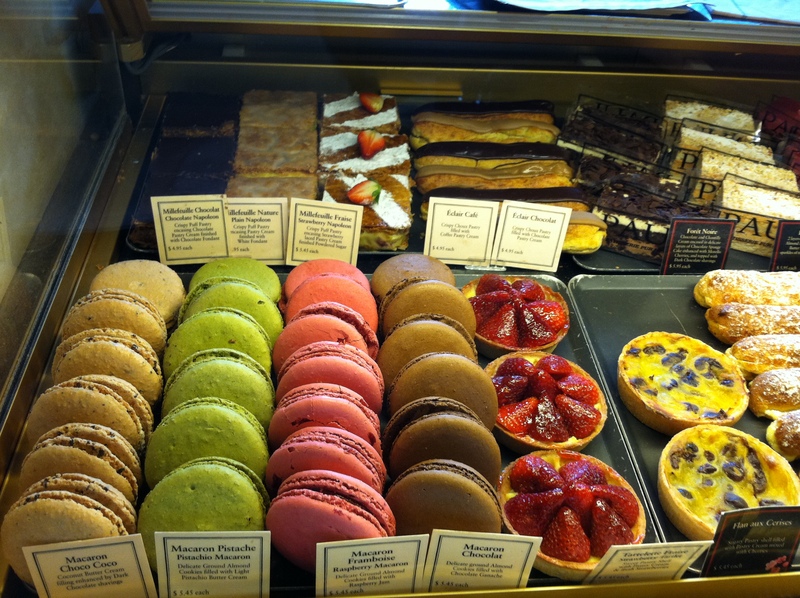 After discovering the French bakery, Paul, on day 3 of my juice cleanse, I had been dreaming of their macarons. I picked up a couple of the almond-meringue-ganache treasures for the road trip. They were incredible. Not only were they the perfect texture: chewy and crispy, moist and creamy, but I was able to enjoy the flavors in a completely new way. Just as my body has been reset after my juice cleanse and vegan diet, my TASTE BUDS were working at maximum power. This was the theme of my entire weekend in Philly. 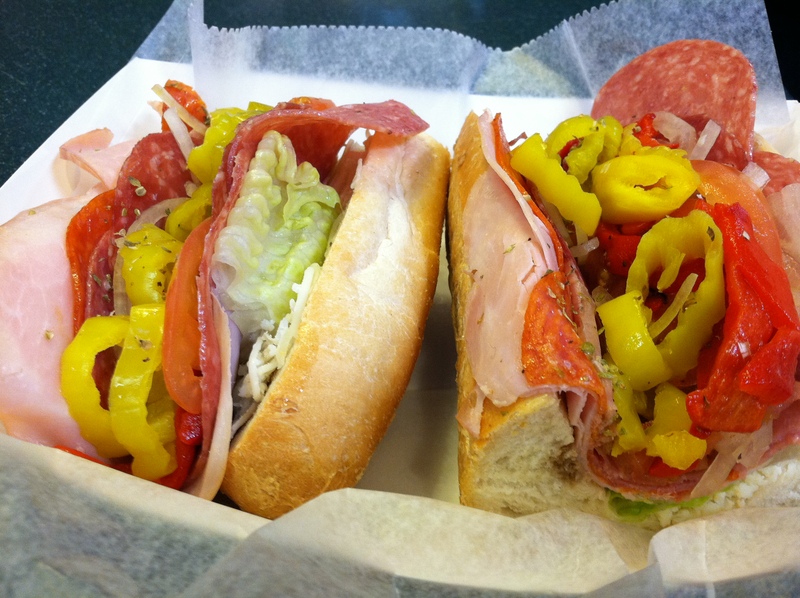 Of course we ate hoagies (incredible), and Amish hot, fresh-baked cinnamon rolls (my friend said they tasted like Barefoot Contessa had just pulled something out of the oven for us), and amazing pickles, but NOTHING compares to the meal we had at Barbuzzo. 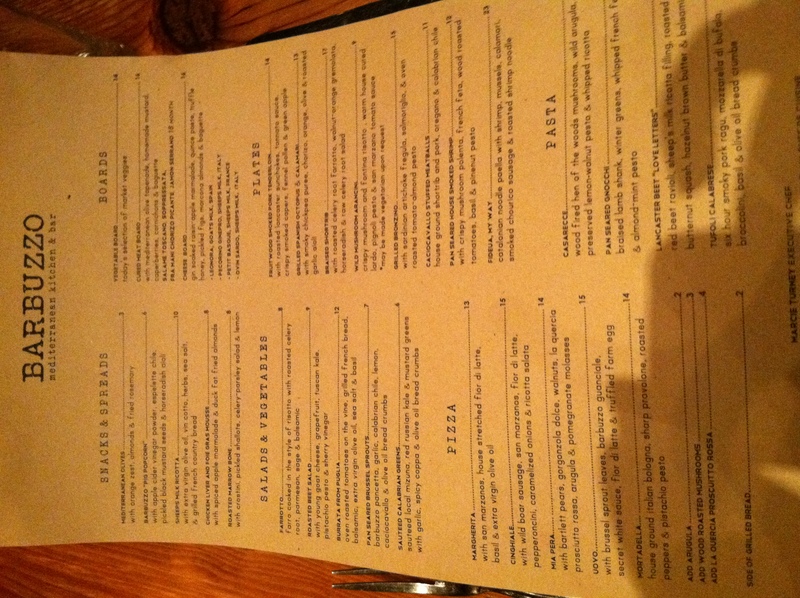 This Mediterranean, farm-to-table, small plates restaurant was the perfect place to eat my first meat and dairy. We started off with a cured meat board, with a great spicy mustard, cornichons, and olive tapenade with sliced baguette. As my first meat, I chewed very slowly, and enjoyed every morsel of the salty, spiced, salami and seranno. 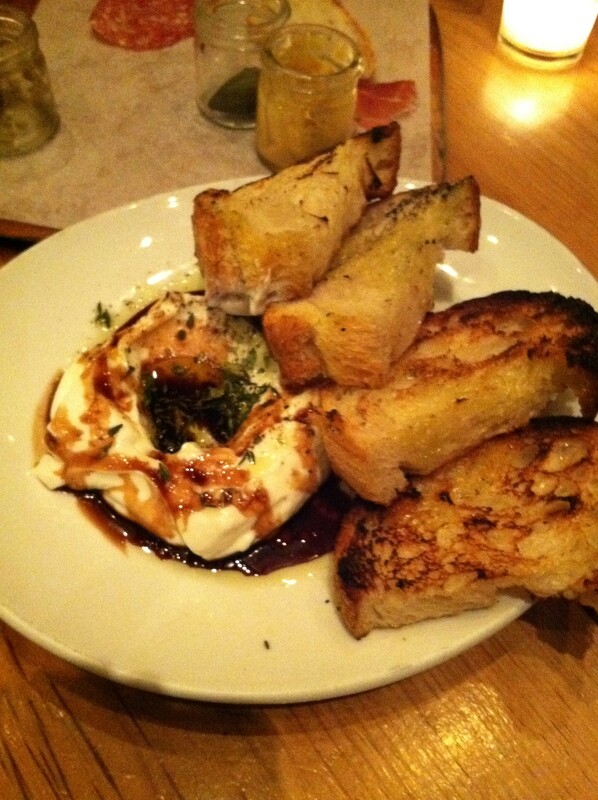 Next, we had the Sheeps Milk Ricotta. Oh my God. This cheese was like nothing I had ever experienced. It had a slightly sheepy flavor (which I love) and was as creamy as sour cream. It was drizzled with a sweet red-wine reduction and some very fragrant EVOO, and served with slices of incredible thick, grilled bread. Next we had the roasted beet and goat cheese salad. Now, I know that every restaurant puts a beet and goat cheese salad on their menu — it’s definitely the rage — and usually it’s quite good but nothing very new and different. Not at Barbuzzo. The roasted beet and goat cheese salad was served over a bed of kale chiffonade tossed in a pistachio pesto with a sherry vinaigrette. What really set this dish over the edge for me was the inclusion of the sweet and citrusy ruby red grapefruit segments. (I obviously bought ingredients at Whole Foods yesterday for my attempt to replicate this wonder.) The cool creamy bites of cheese mixed with the robust greens drizzled with that sweet and nutty vinaigrette coupled with the tangy, juicy grapefruit — sheer bliss. 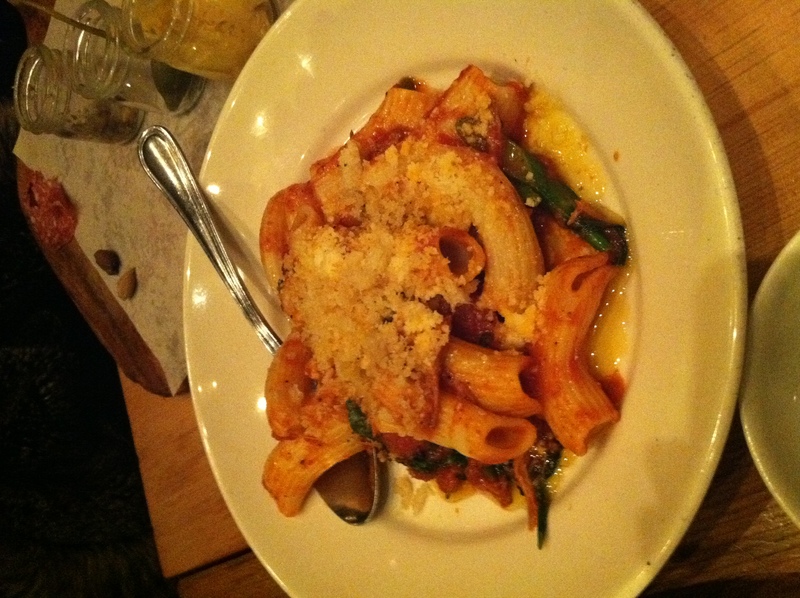 After this triple punch of KNOCKOUT flavors, we tried the Tufoli Calabrese (Tufoli is a type of pasta noodle — similar to Rigatoni), which had a slow- cooked smoky pork ragu, with buffala mozzarella, brocollini, and some breadcrumbs on top. 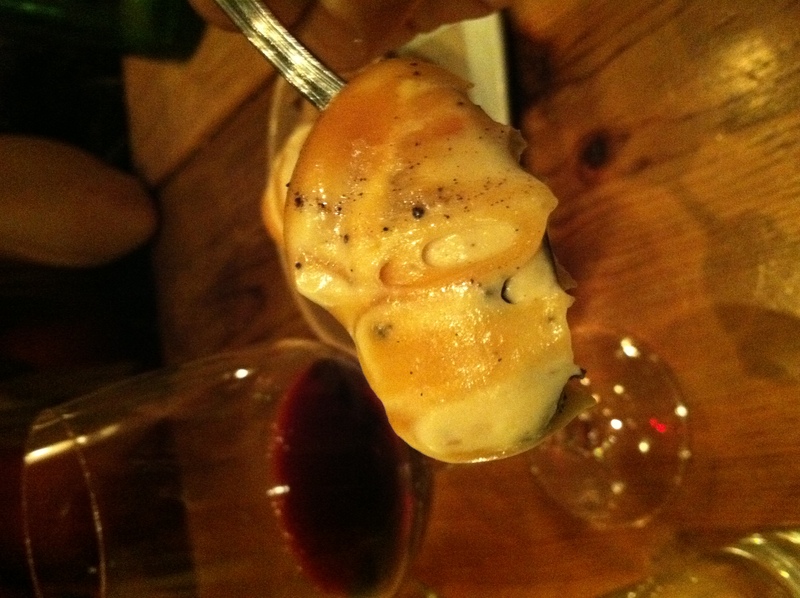 I thought this dish was good, but not as mind-blowing as our first few dishes. After the pasta (you can see that we really went to town on the menu ordering everything — but I promise the plates were small 🙂 ), we had the Uovo pizza. I swear birds started chirping when I bit into this pizza. 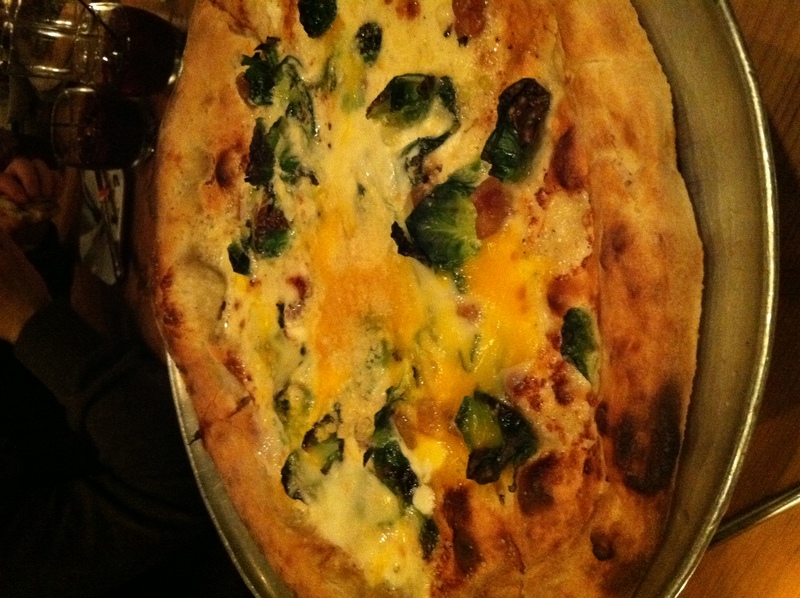 Aside from the crust being perfectly amazing, it was topped with a garlicy light creamy white sauce, brussel sprout leaves, guanciale (pork cheek that tastes like non-smoked bacon), mozzarella, and drum roll…a truffled farm-fresh egg. If you haven’t had a fresh egg (that is still orange in color before it turns yellow with age), this was the PERFECT way to have it. Perfectly satisfied with our incredible meal, we decided to try dessert. As a person who doesn’t love sweets and was grappling with what I thought would be an evening of gastric distress, I had read so much about the Budino dessert and I knew we had try it. 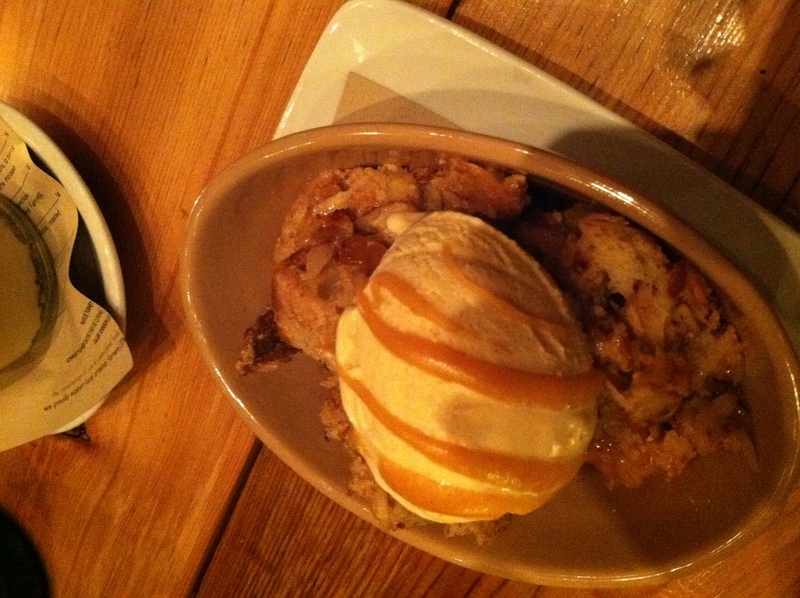 We decided to order the apple and raisin bread pudding and the caramel Budino. The bread pudding was great, had nice big chunks of multicolored bread and was creamy and topped with apple cider gelato. I have to rush through that dessert because when I dipped my spoon into the Budino and tasted it, I swear bells starting chiming. I can’t really explain to you why PUDDING was in my friend’s top 3 desserts of all time, but it was in mine too. The pudding came out in a mason jar and didn’t look like much. Tasting is believing. It was light and creamy, but still somewhat dense and had an almost satin-like texture, with the most insane caramel flavor. It wasn’t overly sweet but had a good bit of salt running through which really brought out the caramel notes. The pudding was layered on top of dark chocolate cookie crumbs that tasted like Oreos, and on top was a whipped creme fraiche that felt like whipped cream but tasted like sour cream so the combination was sweet heaven. Perfection in a jelly jar. After our dinner the next evening, we contemplated returning to Barbuzzo just to get the Budino again for dessert. But we didn’t. With Michelin-starred restaurants in Napa and Italy, as well as amazing restaurants in France, N.Y.C., and New Orleans under my foodie belt, I still would consider this meal to be in my top-5 dining experiences ever. The next evening we tried one of Philly top chef, Iron Chef extraordinaire, Jose Garces’ restaurants. It was good…but after the bar that Barbuzzo set, I don’t even think Thomas Keller could have surpassed it. Well, yeah he probably could have. We ended our trip with an incredible brunch at a cute little place called Sabrina’s (where I had scrambled eggs with a cornmeal-green onion-sour cream biscuit) and had the perfect ricotta cannoli from Isgro Pasticceria to carry home to D.C. This weekend, I discovered another benefit of juice-cleansing to add to my growing list: the cleanse awakened my palate. I was able to discover food and flavors in a completely different way. The manner in which I could identify subtle nuanced flavors might rival a Top Chef discerning palate quick-fire challenge. All in all, I definitely cannot wait to return to this city of culinary wonder and keep my taste buds working at optimum power.